As his affiliation and financial commitment to Joseph Smith deepened, immediately prior to the publishing of the Book of Mormon, Martin Harris sought greater confirmation of Smith’s prophetic calling. In 1828 at Harmony, Pennsylvania, Joseph Smith copied some characters from the gold plates, while shielded by a curtain hung across the room. Smith later confirmed, “I copied a considerable number of them…” (History of the Church 1:19) Martin promptly set off to confirm the veracity of the mysterious characters. The history associated with the script deserves special attention, as it provides a compelling opportunity to evaluate evidence and conflicting statements from diametrically opposed perspectives. Seeking confirmation that the characters were genuine, Martin Harris traveled with script in hand to Samuel Mitchell, a well known authority on American antiquities. He declined to comment, instead referred Harris to Charles Anthon, a respected Columbia University professor. Smith’s original 1832 account of this episode, recorded by his own hand in Letterbook 1, makes no mention of him translating the characters, Anthon’s inability to read a sealed book or his authentication of the characters as Egyptian. 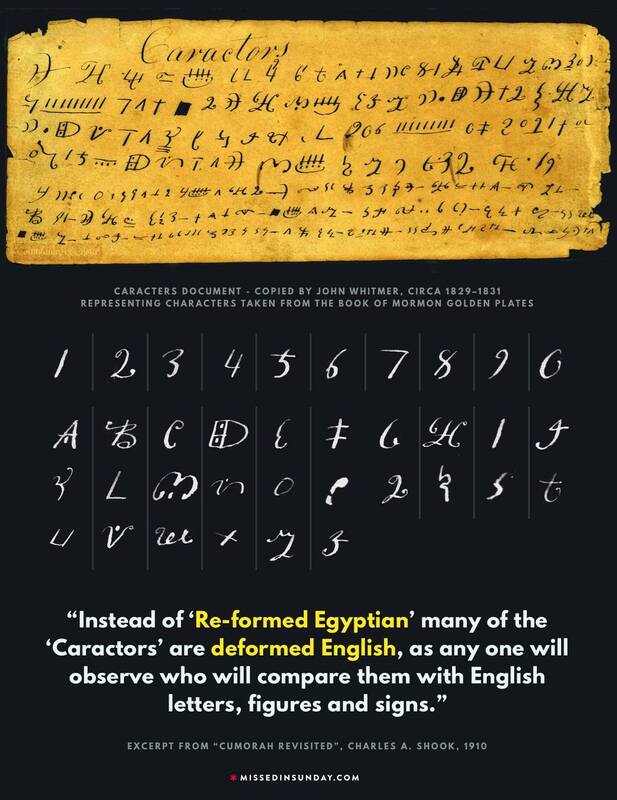 Word spread that the Mormons were using his good name to promote the Book of Mormon, prompting Anthon to write, “The whole story about my having pronounced the Mormonite inscriptions to be ‘reformed Egyptian hieroglyphics’ is perfectly false. Charles stated, “I began to regard it as part of a scheme to cheat the farmer of his money…” (Letter to E.D. Howe, New York, Feb 17, 1834) Anthon consistently refuted Smith’s story for the remainder of his life, even protesting “…what a monstrous lie the Mormons are uttering…” (New York Observer, May 3, 1845). 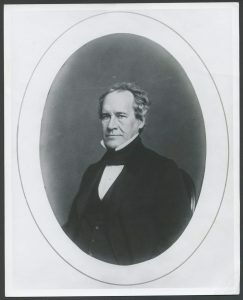 Smith embarked on an updated church history in 1838. Joseph’s recollection included mention of Anthon providing a certificate of Smith’s translation, “…certifying to the people of Palmyra that they were true characters, and that the translation…was also correct.” Smith’s narrative also asserted, “Professor Anthon stated that the translation was correct, more so than any he had before seen translated from the Egyptian” (History of the Church 1:20). Both of these statements appear to be expansions on what actually transpired. Based largely on the handwriting, the Church suggests that the document was written by David’s brother, John Whitmer, while pointing out that he “did not meet [Smith] until 1829, more than a year after Harris’s journey to New York.” It reaffirms “The earliest John Whitmer could have produced this document was after he first met [Smith] in June 1829…” Other scholars, such as Brent Metcalfe, suggest the author was his other brother, Christian Whitmer. The contested authenticity of the script brings David’s statement into serious question. Joseph Smith Papers: Characters copied by John Whitmer, circa 1829-1831. The LDS Church itself takes issue with Whitmer’s credibility in other areas, such as Joseph Smith’s method of translation: “In our judgment, Mr. Whitmer is not a reliable source on this matter. We are entirely respectful of and grateful for the testimony to which he appended his name as one of the three witnesses of the truthfulness of the Book of Mormon and its divine origin. That, however, does not make him a competent witness to the process of translation” (David Whitmer Interviews, Cook, 115, 157-58). Isaiah 29:11-12 reads, “And the vision of all is become unto you as the words of a book that is sealed, which men deliver to one that is learned, saying, read this, I pray thee: and he saith, I cannot; for it is sealed…” It’s worth noting that biblical scholars interpret the sealed book to refer to the voice of Jerusalem. “Smith’s interpretation renders Isaiah’s metaphor essentially meaningless. The learned can’t read the book because it is sealed, not because it is written in an unknown language.” (Dan Vogel) LDS scholar Robert Cloward confirms “…the vision of Jerusalem’s people has become AS a sealed book. No specific book is mentioned. Isaiah’s concern was the lost vision of his people, not books” (Isaiah 20 and the Book of Mormon, Cloward, FARMS, UT 1998). Smith’s 1838 retelling is the first we hear of Anthon’s retort about his inability to read a sealed book. At the time of Joseph’s 1838 revision of Martin Harris’ experience, Martin was no longer a member of the church, so the words were entirely Smith’s. The original manuscript confirms that Smith’s clerk wrote the new and expanded “cannot read a sealed book” language between existing manuscript lines, in a different color ink. Even to the casual observer, Harris’ inability to bring the book because it was sealed makes little sense. Only a portion of the book was sealed, leaving abundant pages for review and translation. Smith had previously stated that no man could look upon the plates and not perish, so that, if true, would have been a valid reason. 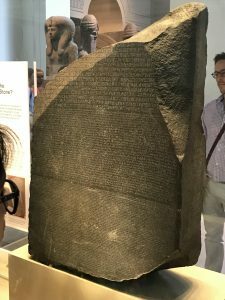 When exploring the contrasting claims of Smith and Anthon, it is important to recognize that almost nobody could translate Egyptian (much less still undiscovered reformed Egyptian) in 1828, as the Rosetta Stone’s code was only beginning to unfold to Jean Francois Champollion. LDS Scholar Stanley Kimball, reaffirmed that “Champollion himself was just beginning to ‘break’ the language and could actually translate little more than royal titles and demonstrate the inner relations… Therefore not too much weight can be given to the [purported] statement by Anthon…” (The Improvement Era, Charles Anthon and the Egyptian Language, Stanley Kimball, Oct 1960). Professor Anthon studied ancient Greece and Rome, not Egypt. It is extremely unlikely that a credible professor such as Anthon would certify in writing, to a total stranger, the correctness of a translation he lacked the ability to verify. Joseph’s 1832 account, in which Anthon is said to have stated he could not recognize the characters, appears far more believable and coincides with Anthon’s consistent statements.